Surviving an EMP requires diligent planning. While the basics of survival are all the same no matter what type of disaster you are most concerned about, planning to maintain as much functionality as possible after and EMP, does mandate taking a laundry list of specific precautions. Before you can adequately prepare for an EMP, you must be well-versed in not only what an electromagnetic pulse is, but what it will do to our technology-dependent modern society. If an EMP attack happened tomorrow, would you be ready to suddenly find yourself living in an 1800s era world? If not, please read on, because that is exactly what will happen if such a long-term (really, really long-term) disaster is inflicted upon us. Electrical current is produced when a conductor maneuvers through a magnetic field. This type of activity happens every single day, when the massive generators at power plants churn out the electricity that powers our lives. But, when the reverse happens, when a magnetic field passes through a conductor, an electromagnetic pulse is generated. If the magnetic field is stronger than the current, it will damage the wires or waves it travels upon – effectively frying everything it comes into contact with, in the process. Should such a powerful jolt caused by a magnetic field happens, sensitive microelectronics are obliterated – meaning they burst or burn out entirely. The destruction field of an EMP attack will depend both upon how powerful it is and the manner in which it was delivered. In an EMP worst-case scenario, the pulse would originate from a hydrogen bomb – detonating a warhead missile. Such an EMP attack would easily expand the blast field because it radiated out in all directions. The electromagnetic pulse travels via the line of sight and would allow it to hit vast swaths of the United States all at once. An EMP attack like this has the potential to burn out all of the electronics in a thousand mile radius, again – in all directions. The level of radiation created by such a massive electromagnetic pulse would most likely not harm healthy folks, but could kill anyone with a pacemaker instantly. Realistically, all of the 7,000 or so airplanes flying above our heads in any given time across America, would all come crashing down because the sensitive electronic components used to control the plane would also be immediately destroyed. The plane crashes would cause monumental fires, and in all likelihood, firefighters and EMS personnel would be able to rush to the scenes to offer aid and battle the intense flames sparked by the jet fuel because the electronics in their modern vehicles would be fried, as well. An EMP attack could also stem from the use of explosive pumped flux compression generators. These devices spark large electromagnetic energy pulses via a coil that is surrounded by a metal core. The coil is compressed into the core via explosives. The change this causes prompts the compression of the electromagnetic field inside. An EMP attack does not have to be a man-made act or terrorism. 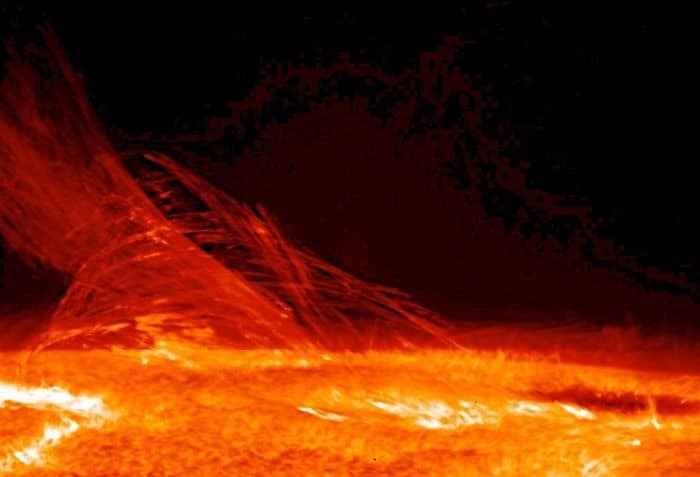 If an X-Class solar flare is released in the direction of Earth, the same level of devastation would happen to sensitive electronics on the ground. The Earth has narrowly dodged a few solar flare bullets over the course of the past several years, Historically speaking, we are long overdue for an X-Class coronal mass ejection. The most recent and largest recorded solar flare happened in 1859 and is known as the Carrington Event. The most sensitive technology of that time was the telegraph. When the X-Class Earth-directed solar flare happened, telegraph wires snapped in half and/or stopped working and in some cases, telegraph workers maintained the papers on their desks caught on fire during the baffling incident. Now that you can fully grasp how devastating an EMP attack can be and how one could happen, let’s take a look at how we can harden our lives (and valuable preps) against such a SHTF scenario. Electrical shielding is merely a fancy way of saying it is a superb idea to store sensitive electronics inside of a Faraday Cage. The cages are named after scientist Michael Faraday who pioneered some early work in the electromagnetic field. The concept of electrical shielding is already commonplace in our lives, you just might not have noticed it. Electrical cables are always grounded – or shielded, to help defray the pulse. The shielding material around the cable redirects the current so that is passed harmlessly on into the dirt. While electrical shielding can work fabulously for large items, like cables, but not for small and especially sensitive electronics. This is where the ingeniously simple Faraday Cage comes in. Like in the example above with the shielded cables, electronics placed inside a lined Faraday Cage will remain protected from the charge that runs around the metal used to make the cage. The key to making a Faraday Cage that works relies heavily on both making sure the electronic items inside are placed inside of a buffer and touch neither themselves nor the cage – and a firmly constructed cage. For an electrical current to flow a differential in electrical potential must also be present. If the current experiences a short circuit before it can begin to flow, the devices inside the cage the current is attempting to flow around, are protected. Faraday Cages have been tested by a myriad of scientists and preppers alike and do work beautifully when properly constructed, but to what degree they can maintain their protective shielding during a SHTF level blast like we should all be prepping for, remains to be seen. In laboratory simulation tests, Faraday Cages seem to hold up, but there is no guarantee that even if you do anything right and are at the heart of a blast, your electronics will be saved. 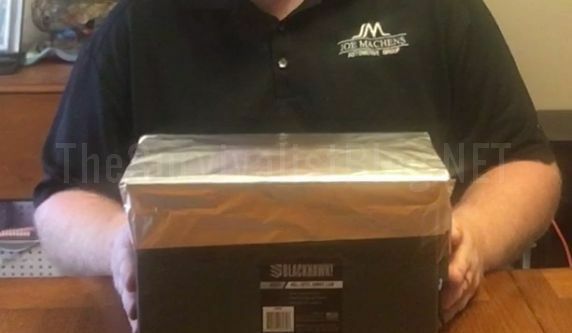 Wrapping aluminum foil around sensitive electronics stored in their cardboard boxes – or inside of a plastic bag in your bugout bag, could further protect them. Burying a cage underground in a manner that will not allow it to be crushed over time by the pressure of the dirt surrounding it, could add yet another layer of protection for your radios, batteries, etc. There are many common and inexpensive items that can be turned into a Faraday Cage. Using a galvanized trash is perhaps the most common and the easiest way to make one. The cans are relatively inexpensive, thick enough to provide adequate protection for the electronics stored inside, and have a firm-fitting lid. Metal ammunition cans are also commonly used for Faraday Cages for small electronics and to protect batteries. Some preppers have use microwave ovens are cages for small objects like batteries, handheld radios, chargers, and electronic tablets (where survival ebooks and similarly useful items are stored) as a portable backup for hard copies. Typically, only sensitive electronics that are relatively small are stored in Faraday Cages. Larger preparedness gear, like generators, car battery chargers, and similar tools are not typically placed inside of a protective cage because their electronic components are considered sensitive enough to be adversely impacted by an EMP attack. But, it might still be a good idea to store the vital tools in Faraday Cage style, just in case. Purchasing extra vehicle and ATV parts to replace those that could be fried during an electromagnetic pulse, should also be considered. To make a Faraday Cage for large items,like solar panels, solar generators, and to perhaps even to park your vehicles or ATV inside, use a metal storage shed or a pole barn garage. Using sheet metal or corrugated metal as flooring inside either type of structure, will help seal the contents inside the protective covering. The flooring must run the full length and width of the storage building or pole barn garage and be covered with a protective layer of some type – dirt, sand, or gravel can work well as long as it doesn’t run so thin as to create a gap and expose equipment to the bare metal. If you budget allows, you could even store an entire, albeit unassembled, electrical power generation system inside of the massive Faraday Cage. But, do not rely solely on such a pricey (about $20,000 grid-independent) system to bring you power after an EMP attack. Using off the grid alternative power systems like solar, wind, and hydro, should be a primary part of your survival preparedness plan after an electromagnetic pulse. 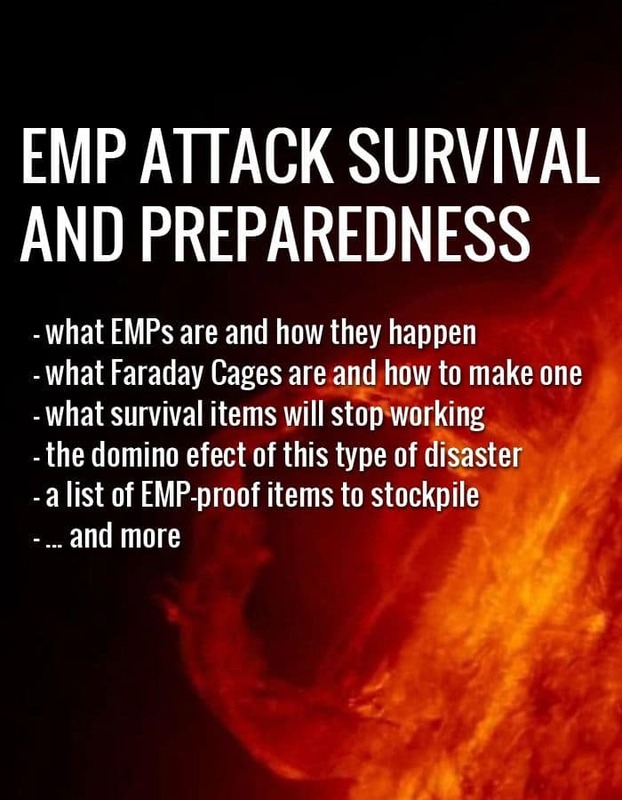 Remember, if the EMP attack was part of a terrorist plot, a second pulse could be coming after folks dig out from the first one and begin removing essential preps from Faraday Cages. It may be wise to live like the early pioneers for a little while to avoid your electronics from being damaged during the second wave…and to not immediately alert all of your panicked neighbors that your home is far more functional and well-stocked than their own. The list of what will still remain operational after an electromagnetic pulse is miniscule. Below you will find just the major highlights of what will no longer be available for your use after an EMP attack…unless they are stored in a Faraday Cage. Vehicles built after about 1950 – a few select vehicles manufactured in the 1970s to early ‘80s may still remain functional. The apocalypse might be brought on by an EMP attack, but the fallout from the SHTF incident can be just as devastating as the lights going out for potentially years to come. Many of the TEOTWAWKI events so many preppers are hardening their families against, will happen after either a man-made or natural electromagnetic pulse event. Some estimates predict up to 90 percent of the population will die during an EMP attack or other type of scenario that provokes a nationwide power grid down disaster. The after effects will cause tens of thousands of deaths of non-preppers and even of preppers who have not sufficiently stockpiled both the gear and the skills to withstand what comes next. The United States federal government does not have extra transformers stockpiled – either in or out of a Faraday Cage. If the EMP attack or solar flare impacts more than just America, getting the necessary parts shipped from overseas to replace and repair the power grid, will not be a possibility. In the event of an EMP attack, you will be in effect, totally on your own. Effectively prepping for such a power grid down scenario also means being prepared to deal with all of the domino effects that will immediately follow. Hours after an EMP attack, the unprepared masses will panic, causing looting and lawlessness to begin. Over the course of as little as a few days, the signs of a societal collapse will emerge. If the government is still operational, it is entirely likely that Martial Law will be declared. Water will not be able to flow from faucets in urban and suburban areas. In rural areas, only resident who both have a well and either an old-fashioned manual pump or an off the grid energy source to power it. The only water available will be what people have stockpiled in their homes, find in a puddle, loot from stores, or collect if it rains. If the EMP attack occurs during the hot and dry weeks of summer or during a drought, securing water will become even more problematic. The tractor trailers that bring loads of food and medicine to stores across the country will no longer be able to role after an electromagnetic pulse. The store shelves that likely emptied within about three hours after the incident, will remain bare for the foreseeable future. Fear of starvation will lead folks who were decent law-abiding citizens just 24 hours prior, to be willing to use as much force as is necessary to garner any bit of food that will soothe the ache in their empty belly or stave off the hungry cries of their children. Disease will spread quickly, quite possibly to pandemic proportions, because hospitals will no longer be able to function, first-responders will not be able to rush to you aid, and the absence of modern sanitation will pave the way to raw sewage flowing into the street. If you thought prepping for an EMP attack did not mean being prepared for a pandemic or even another coming of the plague, you are dead wrong. Violent clashes will cause even more deaths as the marauding hordes attempt to bugout to the country. Even rural residents who are not preppers tend to live a self-reliant lifestyle. We not only have an abundance of natural resources, grow and raise our on food, and routinely make and use home remedies, we also have guns and know how to use them. The panicked unprepared will almost certainly be met with lethal force not only if they converge upon private property, but for merely attempting to cross a county line or into a small town that quickly became guarded by armed locals protecting their own. When stockpiling preparedness tools that will be essential after an EMP attack and throughout a long-term power grid down disaster, remember the prepper motto: “One is none and two is one.” Gear can break, get stolen, or be lost. Any vital manual tools that cannot also be used as weapons against you, would typically double as superb bartering items. Manual Can Openers – The P38 military can opener is so small and lightweight it can be hooked to a keychain. Solar Dehydrator – Buy or make a solar dehydrator so you can preserve the food that you grow or raise. Solar Oven – Make or buy a solar oven for cooking and boiling water to purify it. Hand-Crank Flashlights – These flashlights can be tedious to use for an extended period of time, but do not need batteries and provide decent light to walk or work by. Hand-Crank Radio – If any type of government emergency station is still functioning, you could garner essential news about what is going on outside of your own neighborhood or home. Finding out about raging wildfires, a epidemic or pandemic, or societal rebuilding or aid efforts, might just save your life. Manual Water Pump – A small manual dipping pump or a large manual water pump can be used to keep your well fully functional during a power grid down scenario after an EMP attack – and in the years beyond. Manual Grinders – Invest in both manual meat and grain grinders so you can process foraged nuts and grown corn into flour and to process the meat you are raising, hunting and trapping. Butter Churn – With either a small tabletop butter churn or a large traditional butter churn can be used to separate cream and make butter. Oil Lamps – Stockpile oil lamps, extra wicks and mantels, as well as copious amounts of fuel. Purchasing only a single style of oil lamp so you can buy extra replacement globes that will fit all the stockpiled lamps. You can also make your own wicks out of cotton fabric scraps and use olive oil and coconut oil to fuel the lamps in a pinch. 2-Way Radios – Store these radios or another style of HAM radio, in a Faraday Cage, along with spare parts, so you can send and receive messages with loved ones, members of your mutual assistance group, and get news from the outside world that as noted above, could be life-saving information. Solar Lights – These type of lights will have a far longer shelf life that candles, pose no fire threat, and are more durable that oil lamps. Solar lanterns and solar motion detector lights can be used inside your survival retreat home, and your barn and similar locations as a low-tech warning alert that is part of your survival retreat defense plan. Solar Chargers – If you stored your cell phones, laptops, and radios inside a Faraday Cage, they will need to be kept charged to be at all useful. A generator that survives the EMP attack will keep them running only until you run out of fuel. Purchase several camping style solar chargers that are lightweight and portable yet still capable of powering small electronics. Composting Commode – The sanitary disposal of human waste must be a top priority at your bugin, bugout, or prepper retreat location. A simple 5-gallon bucket with a camping toilet designed to fit it, is the most economical route. But, the human waste will still need to be disposed of properly, so the natural water supply and the soil are not contaminated, and disease is not spread. A self-flushing camping composting toilet can typically be purchased for as little as $35 to as much as $100, depending upon capacity. An off the grid composting commode system that looks nearly identical to a conventional commode, would be the most functional and sanity, but carries a price tag of several thousand dollars per unit. Composting solid human waste into what is known as “humanure” might be a useful and safe way to enrich your gardening soil. Seeds – Stockpile heirloom fruit, vegetable, and herbs seeds so you can both grow your own groceries and your own pharmacy or apothecary. Learn how to simply test your soil so you can better cultivate the nutrient-rich earth that is required to achieve a bountiful harvest. Manual Farm Tools – An old-fashioned manual tiller and seed spreader – or horse-pulled farming equipment, will allow you to not only grow the large garden plot needed to feed a large family or mutual assistance group, but perhaps even set you up with an ample yield so crops can be bartered for other goods and services. You should also learn how to make and use your own natural pesticides and herbicides to protect your crops. Manual Kitchen Tools – You should also garner a stockpile of pioneer-style manual cooking tools such as a: potato masher, flour sifter, timer, juicer or press, mortar and pestle, mandolin slicer, cheese grater, butchering knives, rolling pin, coffee percolator, cast iron teapot, as well as cast iron skillets, dutch oven, soup pot, and a griddle. Because you may be cooking over an open fire, purchase a standing or hanging tripod that is sturdy enough to support the cast iron cookware. First Aid – You will have to be your own doctor even if you have trained medical professionals in your mutual assistance group. Do not skimp when factoring medical preps (as well as dental preps) in your EMP attack survival budget. Purchase supplies and acquire the skills you will need to deal with gunshot wounds, severe blunt force trauma, and broken bones – as well as learning natural remedies to substitute for prescription drugs and antibiotics. Although such off label use of livestock and fish medications is illegal, many preppers purchase these medications solely for SHTF use when they cannot call a doctor. Food Preservation – After an EMP attack, using refrigeration to preserve meat and other perishables will not be an option. Solar dehydrators are fine for fruits, veggies, berries, herbs, and drying seeds, but unless you live in a tropical locale, they simply are not suitable for drying meat, especially beef, without bacteria being able to form. Build a smokehouse, purchase or make a charcoal or wood-burning smoker, learn how to salt, honey, or sugar cure meat to preserve it, or depending upon your climate, build an ice house. Turning a section of a basement or insulating a cinder block storage building into an ice house, is not particularly expensive or difficult. Lining the walls and ceiling with thick Styrofoam, will help insulate the structure. Fill the room with storage shelves and then place 5-gallon buckets with ice. Thickly layer sawdust above and around the ice buckets to further insulate your chill source. Transportation – Horses will one again become the kings of the road during and after an EMP attack. A prepper who owns and breeds horses and has leatherworking skills, just may become a highly successful post-SHTF entrepreneur during the societal rebuilding phase. Invest in hauling wagons for use in the months or years after the electromagnetic pulse attack when the roadways become relatively safe. ATVs and motorcycles that have been stored in a Faraday Cage (or older motorcycles) use far less gas than a vehicle, taking up less of your fuel stockpiles. Some more modern and easier to find vehicle that MIGHT withstand an EMP attack include the: 1979 Jeep CJ5 4×4, 1983 Ford Bronco, and the 1972 Volkswagen Beetle. The three most important decisions you can make when developing an EMP survival plan are: where you will live, how much time you will devote to the acquisition and mastery of skills, and putting together a dedicated mutual assistance group. Living at least a one hour drive from a city and at least 20 minutes from a 4-lane highway, will position you away from the initial wave of the panicked marauding hordes. Joining or building a mutual assistance group – or as I prefer to deem ours, my tribe, is also a must. You need bodies to work and protect a prepper retreat, a family of four, no matter how skilled, cannot perform the 24/7 perimeter patrols that are essential to your longevity. Creating a skills “to do” wish list with your mutual assistance group should be a top priority. The skills must be learned, honed, and then cross-trained to avoid any single person to be the owner of a vital skill. Life will be tenuous in the aftermath of an EMP attack, and you won’t be able to merely Google the answer to your survival questions or watch a YouTube video to learn how to suture a wound. I see errors here. While the author may have written a book, anyone can write a book. Please tell me what specific training and education she has in the field so as to be able to offer advice to the rest of us. In my case I’ve worked with electronics for more than 50 years and have 2 engineering degrees..
Before you can adequately prepare for an EMP, you must be well-versed in not only what an electromagnetic pulse is, but what it will do to our technology-dependent modern society. I am well aware of what constitutes an EMP and what its effect may do to large systems on which we depend, having studied the effects of the July 9, 1962 Starfish Prime test while studying physics in High School and college, some 45-50 years ago. If an EMP attack happened tomorrow, would you be ready to suddenly find yourself living in an 1800s era world? The answer here is a definite yes, with the only uncertainty being the duration of the recovery, since when my pacemaker battery runs out in about 6 years, I need a new device, or it and I will cease to function. I also think that not everyone and everything will be sent back to the 1800’s, and a lot of personal modern systems will survive with simple mitigation. For those who have no backup and require the infrastructure to keep them alive and well, they will have a big problem. A lot of our youth will probably go insane when they can no longer text their friends and family across the table, LOL. I have had some email conversations with EMP expert Dr. Arthur T Bradley about protecting my whole house propane fired generator, and we think it will probably fair rather well as is; but, I will be adding some additional protections to it this summer. Here’s more information on this guy who actually answers personal emails. Dr. Arthur Bradley writes from personal experience about preparing for a wide variety of disasters, including earthquakes, tornadoes, hurricanes, floods, house fires, massive snowstorms, electromagnetic pulse attacks, and solar storms. He has numerous certifications in electromagnetics and is viewed as a world expert on the topic of EMP preparedness. His interests include shooting, martial arts, travel, and writing. This description is generally correct; but, I would use ”passes through” or ”moves within”, instead of maneuver, and it doesn’t really matter if the conductor moves through a stationary field, or a stationary conductor has the field move through it, since both produce a current. This is completely incorrect and misses the basic physics. From the standpoint of generating a current, it does not matter if the field or the conductor does the moving, since the relationship is what creates the current, as the magnetic field pushes the electrons down the conductor. What generates the EMP is a mechanism called Compton scattering and the Compton Effect that requires both an atmosphere and a magnetic field and that works like this. When a nuclear device is detonated in the atmosphere, Gamma rays from the explosion strip off electrons from the air molecules and atoms in the surrounding air. These free electrons are then magnetically attracted to the field lines of the earth’s magnetic field, where they sit momentarily until the energy introduced by the Gamma rays subsides, at which point they all return back to the atoms from which they were stripped. This huge movement of electrons, first into the magnetic field and then back out of it, is by definition, a current, and that large quickly moving current generates a combination electrical and magnetic field in a very short and powerful pulse train that we call an EMP (Electro Magnetic Pulse). For those who understand how a fluorescent light works, the process is similar. When the AC power in the light energizes the mercury vapor in the tube, the electrons from the mercury vapor are stripped off and raised to a higher energy state. When the AC power goes away on the zero crossing, the electrons return back to their position in the mercury atom and release the stored energy in a pulse of Ultraviolet light. That light hits the powder coating the inside of the tube and the powder fluoresces and gives off light. This happens 120 times per second and the powder has enough persistence to ensure the light stays constant enough to not appear to flicker. When the fixture starts going bad, this can slow the rate to the point where we can sometime see the flicker. A Neon light works in a similar manner, except the neon emits a colored light (red / orange). Other gases and chemicals can be used to produce other colors, such as hydrogen (red), helium (yellow), and carbon dioxide (white). An EMP is generated in a similar way; but, on a one time basis with tremendously much more power as a combination electrical and magnetic (EM) field instead of UV light. All radio transmitters and your microwave oven generates similar fields, at different frequencies, durations, and power levels. The heat from your wood stove or the sun is also similar EM fields. Actually, when detonated from a nominal height of 400 km (250 miles) the radius of the EMP effect would be at least 1600 miles, which is more than enough to cover the North American continent. It is not likely to “burn out” all electronics and pacemaker tests have shown them to be pretty resilient, since they are assaulted every day by EM fields from motors, welding equipment, etc, and are designed with those factors in mind. It will depend in part on distance, direction, and orientation of the person and the device if an event occurs. Since I am pacemaker dependent, there is not much I can do about that aspect of my life and worrying doesn’t help, so we prepare otherwise and continue on. The nuclear radiation will generally not affect life because of the distance (inver square law) and the intervening atmosphere absorbing much of the energy. Since these aircraft are essentially flying Faraday enclosures and already have to deal with high static levels and lightning, they are also rather well protected, so once again it would depend on the physics of the power, direction, etc. during the event. This is true; but, the field level is quite small and would only affect a relatively small area in the vicinity of the device when activated. These devices are also only a single use device, since they are destroyed by the explosion of their operation. Once again, you don’t quite understand the physics. A CME interacting with the planets magnetic field can produce nice effects like the Aurora Borealis and the Aurora Australis; but, will not generally affect small electronics not connected to the power grid or a large antenna. The good thing about CME is that we see them coming and have quite a bit of notice, since NASA keeps a close eye on “Space Weather” and the SOHO satellite keeps a constant watch on our sun. This information is already fed in real time to power utilities and satellite based communications companies like DISH network, Direct TV, etc. Finally, you normally don’t have to protect batteries that are already charged and sitting alone in a drawer or on a tabletop, since they have no antenna or small geometry internal components that could be damaged. Speaking of which…..this has been in the news again. Military report online about this.